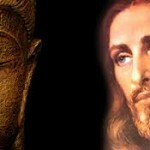 Are You More Buddhist or Christian? In the spirit of the arbitrary and fallacious-but-fun lead-in, “There are two types of people in the world…” let’s see whether you might be more inclined toward being a Buddhist or Christian “type” of person. By this I do not mean whether you believe in or practice either of those two traditions. It is only to ask: What is your orientation, your emotional style, the temperament that fires your imagination and sense of personhood and relationship to the world?